The newest competitor attempting to dethrone the Varidesk, the ZipLift+ introduces an ergonomically-adjustable keyboard tray, a silky-smooth and quiet Z-lift mechanism with infinite stops, a grommet hole for mounting an ergonomic monitor arm, and granite-hard stability even at full 20"+ height extension. For the same money as a Varidesk Pro, it overcomes all the deficiencies of its highly popular, yet outdated competitor's design. Your ZipLift+ ships within 3-4 days of order. Add up to 5 business days for freight delivery anywhere in the continental US. 35 lbs. on top surface, 5 lbs. on keyboard surface. Extremely stable - rock steady. Tremendous height range adjustability, with infinite stops. 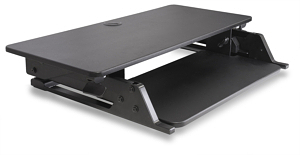 Built-in adjustable-angle keyboard tray separates it from 95% of desktop risers on the market. The built-in grommet hole makes it easy to add any monitor arm to achieve an ergonomically proper LCD height. Arrives fully assembled. 5-Year Warranty. Comes with free EverMat Portable Standing Mat. The adjustable-angle keyboard tray has to reset to zero degrees when sitting - it only works at standing height. Like Varidesk and other similar Z-lift designs, the platform arcs towards the user as it is raised. The ZipLift+ is an ergonomic powerhouse at a far lower cost than numerous other sit-stand converters on the market. Its ergonomic features, such as its tilting keyboard tray and infinite stop height adjustment, make it healthy and comfortable to work at for extended periods of time. The ZipLift+ displays the most advanced design we've seen among Z-lift desktop risers -- for a price that can't be beat. Update: iMovR has made ergonomic enhancements to the original ZipLift. Now dubbed the Ziplift+, this converters's keyboard tray tilts to -15 degrees and comes with a free EverMat Portable Standing Mat. iMovR has also launched a larger 42" wide version, the ZipLift+ HD, which has a higher lifting capacity and wider work surface capable of accommodating two 27" monitors. Update 2: iMovR has launched the made-in-America ZipLift Patriot, featuring 3D-laminated work surfaces. 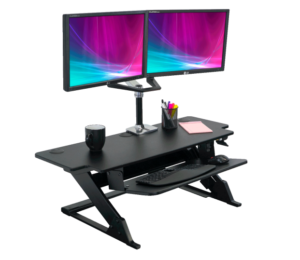 Like all the Varidesk products (example above), the iMovR ZipLift+ employs a similar, but more evolved "Z-lift" mechanism that offers several distinct advantages over the circa-2013 design of the original desktop riser, at an even lower price point. Ever since the dawning of the original Varidesk sit-stand converter in 2013, competing designs have been hitting the market virtually every month. To be sure, these converters—which turn a fixed-height desk into one you can also stand at—come in many different architectural flavors. But the truest "Varidesk alternatives" mimic its Z-lift architecture. These include the Ergotron Workfit-T, the ESI Lift, the InMovement Standing Desk, and countless Asian knock-offs that can be found on Amazon. This review is of the iMovR ZipLift+, the most recent Z-lift entrant attempting to trump all prior designs with more bang for the buck. The Z-lift design differs from base-and-post designs like the Winston, Helium, Kangaroo, and Quickstand, which are inherently less stable (but have other advantages), and the "hover" designs like the iMovR Cadence, Ergotron Workfit-A, Quickstand Light, Helium Junior, and ESI Climb, which are perhaps the shakiest (by virtue of their single attachment point to the desk), but are also the most mobile and take up the least amount of desktop real estate. The key advantages of the Z-lift architecture are stability, low cost, and the speed and ease with which they can be moved from sitting to standing height. Typically this involves grabbing the main work surface on the left and right edges and squeezing the brake release paddles on both sides, moving the platform to the desired height, and letting go. As we've reported in our reviews of all the Varidesk models (the Pro, Pro Plus, Soho, Exec, Cube, and even the Pro Desk), the patented design they've relied upon all these years has clearly been bested by better ones that are truly rock-solid and do not shake at all. And the new iMovR ZipLift+ is no exception. Despite its streamlined look that exposes fewer mechanical linkages than the other units we've reviewed, it's incredibly rigid, even all the way up in its top-most position. We have to rank it equal to the Workfit-T in rigidity; they're both as solid as granite. The svelte design of the ZipLift+ also allows it to be significantly lighter than the other products in this category. At 40 lbs. it's 25% lighter than directly competing units such as the VariDesk Pro and Erogton Workfit-TL. As such it's easier to move aside if you ever need to, and won't kill your back just getting it out of the box. The ZipLift+ changes from sitting to standing more quickly and quietly than other Z-lift desktop risers, with infinite position stops. So all these units share the same basic architecture, but that's where similarities end. 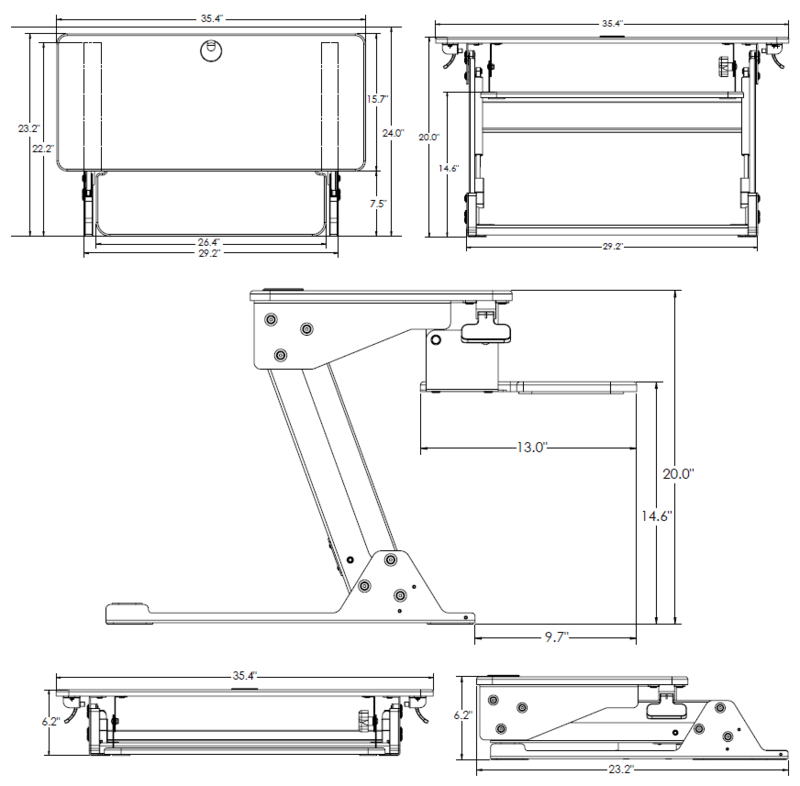 Where other designs, like the Varidesk and Ergotron, use springs to help counterbalance the weight of the computer, monitor(s) and anything else on top of the work surface, and make it easier to lift everything up into standing position, the ZipLift+ uses quiet gas cylinder pistons. And instead of having a specific number of possible settings, usually about an inch apart, the ZipLift+'s range of height adjustment is infinite. Squeezing the paddles releases the Bowden cables (similar to how brake levers work on a bicycle), and you can let go at any point to get to the precise height you desire, no compromises. The result is a completely quiet height change, a delightful reprieve from the clanging noises of springs and sawtooth stops that other Z-lift designs are known for. Many Z-Lift and X-Lift standing desk converters we’ve tested in our labs make loud clanging noises during the lifting process due to their spring lift mechanisms. Some will also make loud clicking noises when latching into place. The trouble with one of these devices (the Varidesks are notorious for their noisy adjustments), is that each time you raise or lower your desk you are subjecting those around you to these irritating and distracting noises. That’s one of the reasons why we’ve always praised models like the Kangaroo (which features an entirely different structural design from the Z-Lifts) because they operate on gas struts which are practically silent during the lifting process. Until the ZipLift, every Z-Lift converter we could find all suffered from noisy lifting. This is because their spring-based lift mechanisms and sawtooth stops practically necessitated it. But the ZipLift’s design is unique in that its Bowden cable braking system permits seamless, silent adjustment. As we were lifting the ZipLift up and down during the testing process, those around us had no idea we’d either made an adjustment. As it should be. Aside from annoying coworkers, which is something we’d all like to avoid, a noisy lift process might also deter us from making the transition between sitting and standing (due to the concern we have around irritating our coworkers). The innovative design of the ZipLift’s lift mechanism is a refreshing change for Z-Lifts, and one we’d like to see emulated on future models in this category. 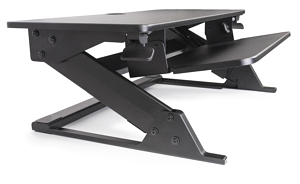 The ZipLift is more structurally sound than other Z-Lift and X-Lift style standing desk converters. Its solid metal frame contains one bar linking the base with the work surface. Most other Z-Lifts and X-Lifts, like the Varidesk and Flexispot, have dual metal bands playing this same support role. Not only are these bands flimsier, they are cheaper and less professional-looking for use in a nice office setting. Dual metal band models also present more pinch threats than the ZipLift. That's why you'll see warning stickers proliferating across their frames. They have double as many areas to pinch your fingers during the lifting process. It's good to see the ZipLift cuts down on this potential safety hazard. The ZipLift+'s adjustable-angle keyboard tray sets it apart from 95% of its competitors. We've commented before about the irony of companies with names like Ergotron and ErgoDesktop—and ergonomic granddaddies like Humanscale—creating sit-stand converters that have no ability to change the keyboard tilt angle. Last time we looked Humanscale made 159,000 models of adjustable keyboard trays, yet their stylish and pricey QuickStand products have no keyboard tilt adjustability. So we were delighted to see this feature in a unit as inexpensively priced as the ZipLift+. With the simple twist of one knob you can change your keyboard tray angle to eliminate any flexion or extension in your wrists. Our only knock on the ZipLift+'s adjustable-angle keyboard tray is that unlike iMovR's own Cadence—still the most ergonomically adjustable sit-stand converter on the market today—the keyboard tilt on the ZipLift+ only works in standing position, not when seated. So it has to be undone each time you switch to sitting, which isn't hard to do, but it is an extra step to remember to loosen the knob before bringing the platform back down. Every design will have some trade-offs but overall we'd rather have the angle-adjustability in standing mode than not have it at all, as this is something sorely missing on 95% of sit-stand converters. 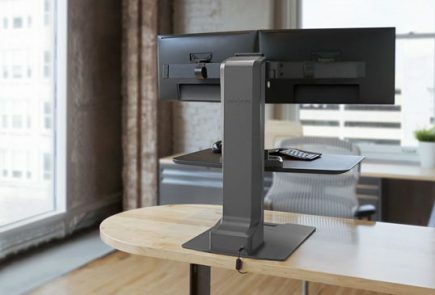 The other ergonomic bugaboo we frequently bemoan about competing desktop risers—especially the Varidesks—is the lack of a good way to mount a monitor arm on them, so that you don't end up craning your neck down to look at your monitor when standing. As we expound upon in our article on anthropometry and ergonomics, most people require their monitors to sit higher off the platform when standing versus when sitting, and the built-in stands on virtually all LCD monitors just weren't designed to go high enough for standing users. 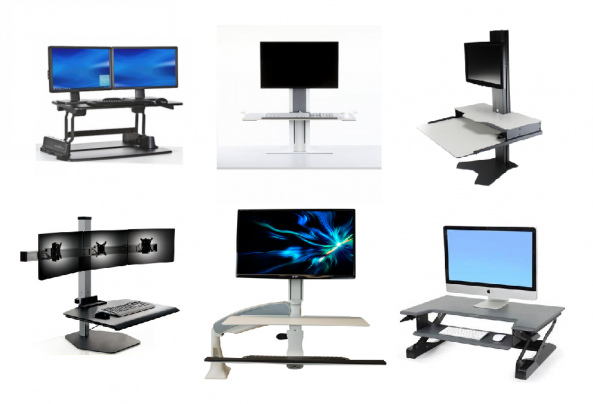 A monitor arm is a virtual necessity to prevent neck strain when using a desktop riser, and many designs don't give you a way to do that as easily as you could on an regular desk. The ZipLift+'s built-in grommet hole makes it easy to mount most any monitor arm to get a proper ergonomic screen height when standing. The ZipLift+ has a convenient grommet hole at the back of the work surface that can take most any monitor arm on the market (most can be either edge-clamped or grommet-mounted). Providing a grommet hole is such a simple solution, yet a lot of these Asian manufacturers really don't understand standing desk ergonomics, and don't care to. They rely on a low entry price to gain market share, and they succeed beautifully—especially Varidesk. But eventually, Varidesk users tend to move on after their "starter" experience and seek out a sit-stand converter with more ergonomic sensibility. 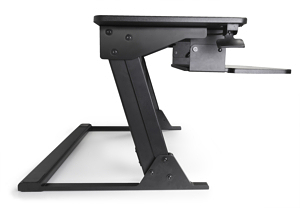 The ZipLift+ is a great go-to for these users as it is significantly less expensive than high-end risers that feature this kind of height-range adjustment and monitor arm capacity, AND it has an adjustable-angle keyboard tray. That's quite a bargain. The ZipLift+ takes up only 23 inches of depth on your desk, the upper work surface being a capacious 35.5" wide and 16" deep. The lower keyboard platform is also capacious at 26.5" wide and 13" deep, which is 2" wider than on the Workfit-T (a common complaint on the -T being insufficient room for both keyboard and mouse, and hence the introduction of the slightly wider Workfit-TL). One thing that we always look for in a desktop riser design is depth-of-field. That is, how much room will there be between your eyeballs and your monitor(s)—or in ergonomics parlance, the "design eye" of the unit. The ZipLift+'s design eye depth is one of the best, almost as good as its cousin's, the Cadence, and better than most base-and-post units—meaning you can mount a good sized monitor or even dual monitors and not find yourself too close to the screen. Introducing the ZipLift+ HD 42"
ZipLift+ HD 42" desk converter features a lift capacity of 45 lbs and a work surface width of 42", enabling it to easily accommodate two 27" monitors. The new model ZipLift+ HD 42" offers a superior lift capacity for those who wish to use two 27" monitors with their laptop and still have some surface area to keep their notes and coffee cup. At a 45 lb. weight limit the HD (as in heavy duty) model also boasts the same 20" height range as the 35" ZipLift+ (one of the widest in the converter market) and will accommodate users from 5' 0" up to 6' 7". It comes with an adjustable keyboard tray with a 15° angle tilt and a silent lift mechanism that can effortlessly adjust to 11 different positions, stopping at the exact moment you release the hand paddle. Just like with any other converter, though, if you attach dual monitors to the HD, a little additional force may be required to lift the device, as the weight of the monitors may exceed the counterbalance force of 15 lbs. Like its 35" predecessor, the ZipLift+ HD also comes pre-assembled for straight out-of-the-box use, ready to place on even the most compact table/desk surfaces. Since its introduction in late 2016, the ZipLift has become one of the top selling converters on the market. In a sea of cheap Varidesk knock-offs coming from Asia, it stands apart as a high-quality product with rock-steady construction, more ergonomic adjustments than you'd expect at this price range, and exceptional height range. The fact that you can use any off-the-shelf ergonomic monitor arm with it is another plus. Because of its clever design and lower price point, the ZipLift+ has also become the converter of choice for companies looking for something more ergonomically friendly and/or lower cost than the Varidesks they've purchased in the past. Bulk discounts are offered on full pallet purchases (Qty 10 per skid). To learn more about our review process, please check out the Anatomy of a Review. To compare the ZipLift+ to its competitors in more detail, please check out our comprehensive Standing Desk Converters Comparison Review. Top Work Surface: 35" W X 16" D X .5" H; maximum weight capacity 35 lbs. Keyboard Tray: 26.5" W X 13" D X .5" H; maximum weight capacity 5 lbs. The iMovR ZipLift+ is backed by a 5-year warranty. The iMovR ZipLift+ ships for free in the contiguous 48 states. Delivery in 3 to 5 business days. Contact iMovR for shipping charges to other destinations.